A young bisexual British lord embarks on an unforgettable Grand Tour of Europe with his best friend/secret crush. Henry “Monty” Montague doesn’t care that his roguish passions are far from suitable for the gentleman he was born to be. But as Monty embarks on his grand tour of Europe, his quests for pleasure and vice are in danger of coming to an end. Not only does his father expect him to take over the family’s estate upon his return, but Monty is also nursing an impossible crush on his best friend and traveling companion, Percy. So Monty vows to make this yearlong escapade one last hedonistic hurrah and flirt with Percy from Paris to Rome. 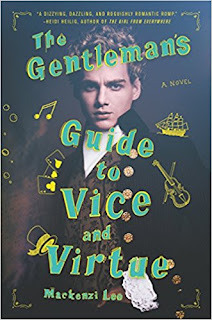 But when one of Monty’s reckless decisions turns their trip abroad into a harrowing manhunt, it calls into question everything he knows, including his relationship with the boy he adores.Witty, dazzling, and intriguing at every turn, The Gentleman's Guide to Vice and Virtue is an irresistible romp that explores the undeniably fine lines between friendship and love. I don't know where this book came from (well I do) but this is the book I needed. This was the book I needed to read to get me out of a slump, to get me back into my groove, and for me want to watch Downtown Abbey. I have seen a couple of episodes and it felt that I was there laying on my couch, with a cup a tea, watching the gay version of this show, and I absolutely LOVED it! I find it hard to write on how awesome this book is and how it is a must that you go and pick it up. Whether it be at a bookstore, a Target, or even your library...get this book. Divided into parts by where the character are currently in their travels, the reader follows two boys and a sister as they embark on not their typical idea of a vacation. The story propels the reader forward pulling at emotions just enough to get you to keep reading. With love, sadness, happiness, this diverse cast of characters deliver a novel that challenges your assumptions of a typical historic fantasy novel. Mackenzi Lee pieces together a masterpiece that is both fresh and enlightening. If you are looking for a story that will take you over the lands of Europe with the sense of adventure, action, and potential danger lurking in the darkest of corners this is the perfect book for you. Lee is brilliant in delivering this unforgettable read.